I helped PRWeek pull together some analysis last week of the results of the PR elements of some key Marcoms groups. The results can be seen in the graph below (you will need to access the original file to see clearly. Notes at the end of this post re: sources and basis of data). What the graph very clearly shows is the (unsurprising) turnaround in fortunes of these groups from generally healthy growth rates in 2008, even in the second half in most cases, to substantial falls in the first half of 2009. 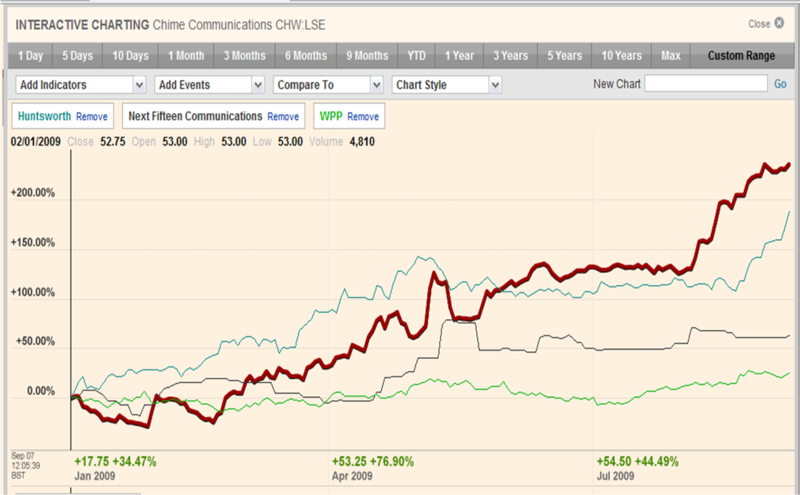 The exception being Chime Communications who have bucked the trend and grown 9.5% in the first half of 2009. To put these figures in context I thought I would delve a little further here and look at relative sizes and then look at the market’s view of PR via their share price performance. The combined PR income of WPP, Interpublic and Omincom was still approximately £1bn in the first half of 2009 (though this includes Interpublic’s event marketing and branding business) and this in turn represented around 11% of their overall total revenues of around £9.5bn. This compares with approximately £115m of PR based revenue for Chime, Huntsworth and Next Fifteen combined in the same period which represents the majority of their circa £165m of total combined revenue. So the big three’s PR income is around 9 times more. The combined market capitalisation of the three larger groups is approximately £16bn as at 7th September 2009 compared to approximately £300m for the three smaller ones. Over 50 times greater. So given their relative size the results of the larger groups are a much stronger indicator of the overall global PR market’s current performance. However the higher proportion of PR income in the income of the smaller groups arguably makes them a better indicator of how the market perceives the PR industry’s prospects given that they are all (Chime excepted) suffering a reduction of PR income of broadly similar levels. The graphs below show the movements in share prices of these same companies since the start of this calendar year. 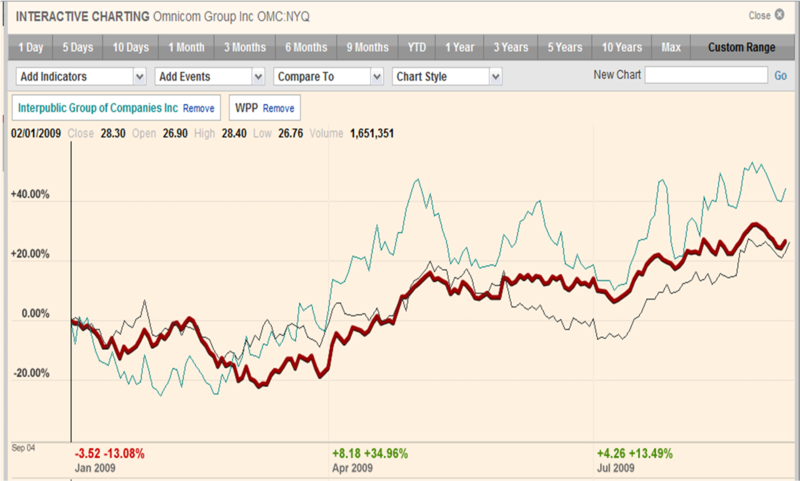 (Again you will probably need to view the actual files themselves – graph 1 – showing Chime, Huntsworth and Next Fifteen, graph 2 – showing Omnicom, Interpublic and WPP). The smaller groups that are either predominantly or wholly PR based (Chime, Huntsworth and Next Fifteen) have all outperformed the larger, broader, Marcoms groups during this period. Chime is up to over three times its level at the start of the year and Huntsworth isn’t far behind. Next Fifteen is also up around 60% despite predicting a significant fall in revenues in the first half of 2009. In fact their share prices are back to similar levels to where they were before the recession started. This compares with increases of around 25-40% for the larger Marcoms groups. They have all therefore outperformed the market generally with the FTSE100 up approximately 10% and the DOW about 5% in the same period. Of course given the difference in size the increases in the values of the larger groups are much greater in absolute £/$ terms than the smaller ones. However it is still interesting to note that these figures imply that the markets’ perceptions of the PR industry’s prospects has improved considerably over the last six months. All of which suggests a healthy expectation of the industry’s performance in the coming months. Let’s hope they are right! The analysis is based on publicly quoted figures included in investor presentations, interim and annual reports, SEC filings and in the case of Next Fifteen for 2009, analyst forecasts. Where possible the growth rates represent like for like organic growth excluding the impact of currency movements or acquisitions/disposals. Exceptions to this are Omnicom and Next Fifteen for whom these figures are headline changes as they do not disclose the impact of these items. Also Interpublic’s figures are based on their CMG division which includes their event marketing and branding businesses. If anyone is interested in the chapter and verse just contact me. ← Byte Night 2009 – A sponsorship plea!